I’m still in the process of juggling all of my finances. I don’t think there is going to be much/anything left over by my next pay day but at least everything that needs to be paid for has been paid for. Birthday presents have been bought, my Next sandals paid for (remember the ones I ordered over a month ago? ), the electric window on my car has been fixed and I feel like I’ve just about got a clean slate! I seem to be managing on my smaller budget okay so far. Husband has been doing some more fishing and has caught enough that we’ve had quite a few free dinners and have a small supply building up in the freezer. I’ve been contemplating doing another OU course (there’s one on children’s literature that I really, really, really want to do) but, at £700, I just can’t get it in the budget. Maybe next year. Or the year after come to that! I get paid again in two and a half weeks and I have precisely £15.31 in cash in my wallet to last me until then. I’ve got a bit in my account put aside for a couple of father’s day gifts and my LoveFilm payment and that is it! Speaking of LoveFilm, I’m thinking about cancelling it. I joined over 5 years ago and I’ve really loved it but it seems that, at the moment, we just don’t have time to watch any of the discs. We’re working our way (very slowly) through the first series of ‘Lie To Me’ but I think I might cancel it once we’ve watched all of the episodes. By the time we’ve got Baby settled for the night, had something to eat and got our lunch and work stuff ready for the next day there just isn’t time to watch a film before bed. We’ve sometimes got time for one or two ‘episodes’ of something but there aren’t any boxsets of our favourite TV series (Burn Notice, The Unit, Grey’s Anatomy etc) out for ages. It seems to make sense to cancel it at least for a few months until there is something we really want to watch. And that’s about all that is going on for now. Husband is just serving up some mackerel and salad so I’d best be off! If you are into the thrifty/frugal living movement – what is it that spurs you on? What makes you keep going when it seems really tough or you feel like you just can’t be bothered? I get like this from time to time. It’s hard, always thinking about where every penny is going (or coming from!) or always checking you’ve used up every last thing in the fridge when it would be much easier, on those particularly exhausting days, to just get take-out. I don’t get it right all the time but I find I am at my best when I’ve got a really clear idea of what I’m working toward or, unfortunately, if things seem really bad. The biggest amount I ever saved (and then spent most of – by design) was my maternity leave fund. I saved up enough money to top up my maternity pay and to buy baby/maternity related things in advance. It was really, really easy to go without things to achieve this because I really, really wanted a baby! At the moment, the thing spurring me on is feeling a bit worried by things. What if something happened to my job? What if something happened to Husband’s job? What if we can’t sell our house for enough to be able to put down a big enough deposit (and thus can’t buy anything at all?). What if I want to retrain? What if I go completely insane if I never see another country again?! And so on. Don’t get me wrong – I don’t sit around being morbid and negative all day. But these are the things that tend to play on my mind when I feel a bit worried. Thus when when of them pops into my head I find it easy to turn it into a reason to go and make dinner out of random things in the fridge and cupboards. If I’m worried about the future I find it easy to spend a bit of time online to check what we’re paying out for things and find a way to cut the cost. At the moment, rather than being an annoyance, these types of activity are actually giving me peace of mind. I’m doing all I can do and when I think of, or hear about, a new idea I do that too. I have to say my motivation has been riding high the last few weeks. 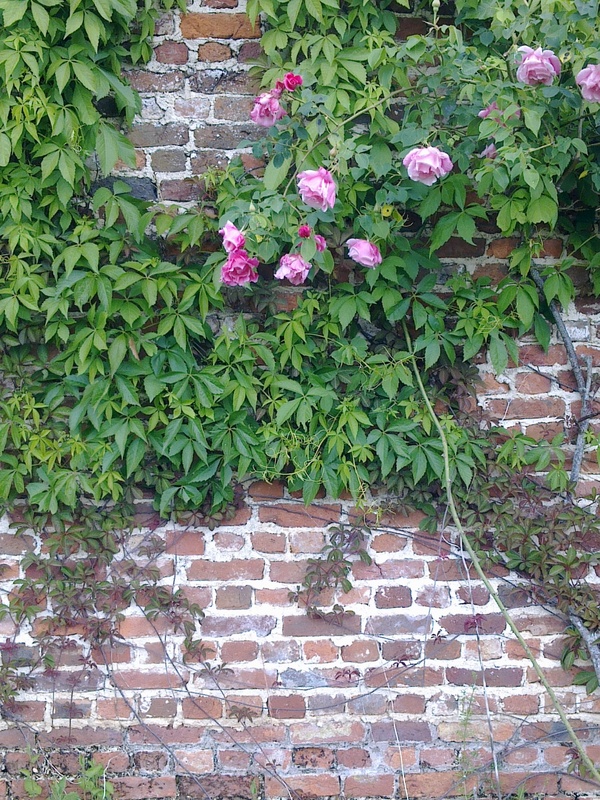 I’ve got that ‘Come on – let’s do it!’ frame of mind about spending less and saving money. I hope I can keep up my momentum. Things that keep me going include: keeping my eyes on the prize (all of the things we’d like to do, like buy a house), reading other blogs about people being inventive, clever and optimistic in thier thrifty lifestyles, also reading blogs about financial management and re-reading my small collection of books on personal finance and frugality. There’s a lot less in the press regarding the economic doom and gloom these days. However, we are far from being out of the woods. I see evidence of the mess we’re in every day; cuts to child tax credits, increased food prices, empty shop fronts, subtle layers of cutbacks and redundancies (not the ‘mass’ redundancies of a year or two ago but the odd position lost here, a few hours cut there and so on). It seems to have less impact because it is old news. But I don’t see that things are going to get better any time soon – the road to economic recovery is going to take years as far as I can see. And it worries me. I’m not exactly losing sleep over it but I’m not comfortable either. Looking back over this post, it does seem a bit negative. It isn’t meant to be. It’s just the reality of where we’re at, at the moment. For us here in the Shoestring household things are okay – nothing specific to worry about as far as we know – but we haven’t got a huge amount of back-up if some kind of financial disaster struck. And so that’s what is spurring me on at the moment. That and all of the things we’d like to do in the future that don’t come for free. What about you – what spurs you on with thrifty living? 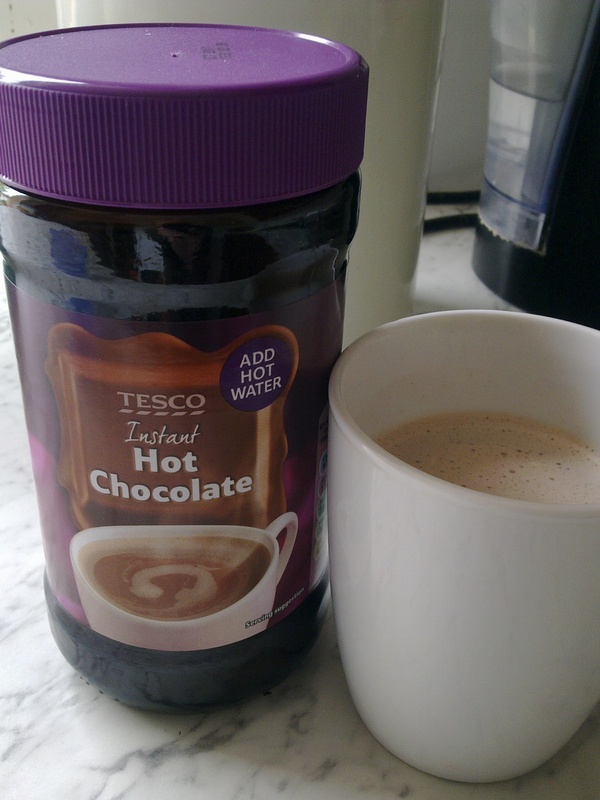 I really love Tesco’s own-brand Hot Chocolate. It isn’t a low fat version or anything like that but I do find that it is satisfying enough to stop me from running out to the shop and buying chocolate when the craving strikes (so cheaper than buying chocolate and surely less calories than a dessert?!). It is only £1.45 for a jar and it lasts me ages. Anyway, on to business. The next stage of running my personal and home finances like a business has been looking at our outgoings. There are quite a few elements to this so I decided to start by looking at all of the direct debits and standing orders on our joint account (which pays for all of our household bills). It turns out we’re doing pretty well. The fixed rate on our mortgage finished last year and out mortgage payment actually dropped because interest rates are so rubbish. Since we’re hoping to move at some point (though it feels like it is never, ever going to happen) and the monthly payment is lower than it has been in years there is no point chasing another deal (particularly as they like to add on ‘administration’ charges just for taking out mortgages these days). Most of our other bills seem to be at good rates too. I couldn’t find a comparable phone package with anyone else (we pay £24.99 a month for our line rental, unlimited broadband and free landline calls at any time of day. They give us a discount on calls abroad and we try to use the free minutes on our mobiles to call other mobiles to not add to the phone bill). However, there are a couple of things that can be improved. The first is our gas and electric bill. I know this really needs to be looked at properly so I’m going to deal with this another day when I can give it my full attention. That leaves our RAC cover. Have you saved money by switching companies recently? At the weekend I made this cake for my Gran’s 91st birthday. 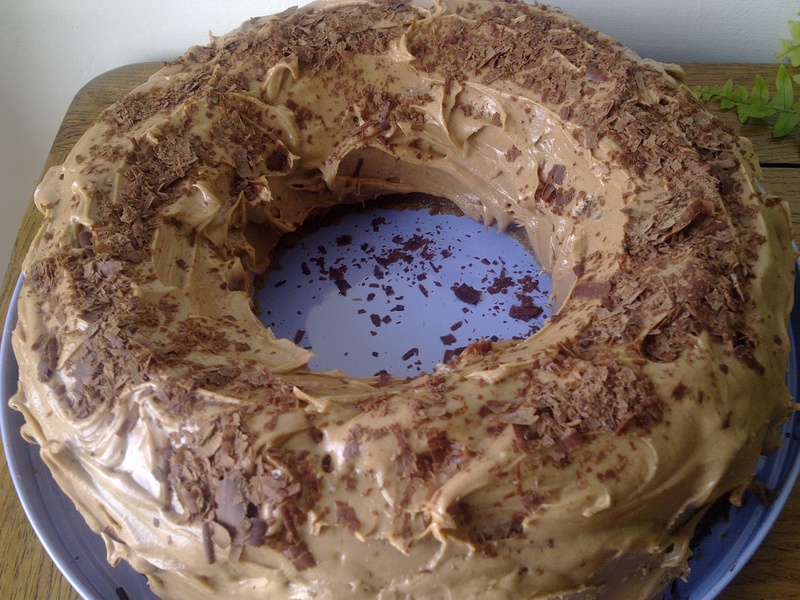 It was a sort of coffee – mocha combo, based on a recipe from the Hummingbird Recipe book. It was good (though that recipe book gives demented quantities. A lot of reviewers on Amazon have pointed this out too. Still, I’ve made a note of how to tweak it for next time)! Anyway, good news on the food budget – I’ve come under! With the way paydays fall it was either going to be a case of stretching the £200 to four weeks this month and five weeks next month or the other way around. Since we were doing so well for this month I decided to take the ‘hit’ of the extra week this month. And even doing five weeks food shopping it came to under £200! I am amazed. I think I had really given up on getting the food shopping down to a reasonable level. There is £4.01 left in the food shopping fund which I expect will get used up during the week as we will probably need another loaf of bread and some more milk (I know you can put both of these in the freezer but it is already full). I really optimistic that with next month only having 4 food shops we’ll be able to save a bit of cash back at the end. It did help that I received my Tesco Clubcard vouchers this week. I got £7 of general vouchers but also some new ones that I hadn’t seen before – £6 off a £40 shop (which I used today and then two vouchers giving £4 off a £40 shop. I haven’t decided how to use the £7 vouchers yet. I know you can double or even treble the value depending on what offers you take up (check out the Tesco Clubcard website for details). For now I’ll just hang on to them and think on it. I might just keep them in reserve for a really skint week/month! I’m a saver again! Yay! I’ve been paid and got a bit more than I was expecting, just for this month (something to do with tax. Whatever the reason, I’m not complaining). It’s just as well as the car has had to go to the garage and – gulp – Baby’s first birthday is coming up! I had already decided that the minimum I was going to save each month was £100 unless exceptional circumstances arose (I’d include going on holiday or something ‘big’ like that under this heading). I’ll try to save a bit more each month but £100 is the minimum. I’d budgeted £150 for the car repair but it only came to £63. They did warn me that I’m going to need a new battery soon so I’ve put back £50 for that (they said it would be less but better safe than sorry). Thus I had £37 left over from the car budget. I budgeted £70 for petrol but when I filled the tank right to the top it came to about £63 so there was also an additional £7 there. I added a few more pounds to take the amount I could save up to £150. Yesterday I received the paperwork on my new ISA and so today I trotted over to my local branch and paid in my £150. This leaves £44 in my easy access savings account just in case something crops up, I need more petrol or something like that. I wasn’t planning on paying all of my savings into my ISA each month as I like to have a few hundred pounds that I can access easily. However, I really wanted to get some cash in my ISA so I could start earning my 3.3% interest! I guess I’ll decide each month how I want to play it. I have to say, being able to save again felt really, really good. It’s funny because I never thought I’d see the day when the most exciting thing about being paid would be being able to put my earnings into a savings account instead of going out and spending it. I’m not saying spending money isn’t fun – it can be. But right now, putting it back for a rainy day feels much, much better. 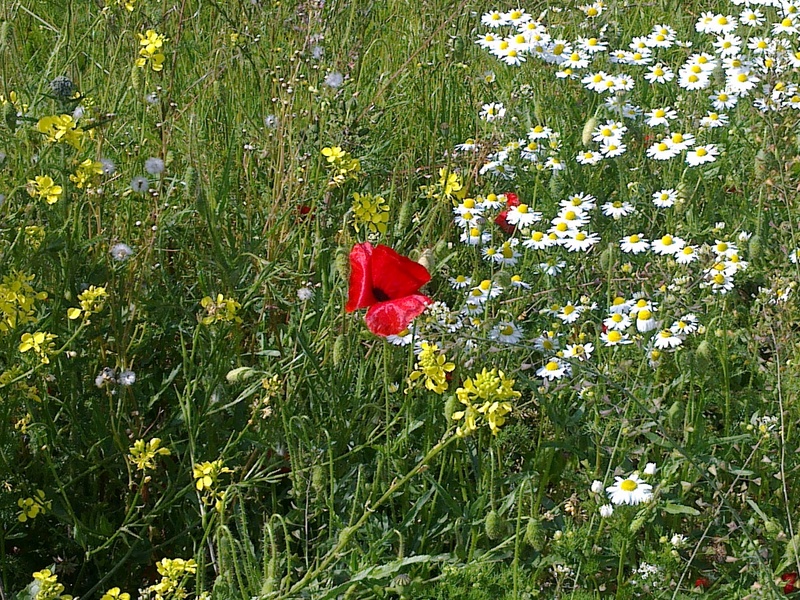 It’s not hard to love living by the sea, surrounded by beautiful countryside. Sure, the wages are low and the house prices are high but when the weather is good you realise you really are living in a holiday location. And just occasionally there are additional benefits such as…free food! Husband has just taken up fishing. As in beach casting (or whatever it is called). Some friends of ours have been doing it for years and he joined them for an evening a couple of weeks ago. He was hooked (excuse the pun). The next day he bought a cheap rod from the local fishing shop and has been doggedly trying to catch something ever since. After several evenings of throwing back tiny fish he finally scored – mackerel! Fresh mackerel is my favourite, favourite, favourite fish to eat. I really love it – the delicate flavour and texture are just gorgeous. Thus we sat down to dinner the other night and had baked mackerel and salad and the fish was totally free! My kind of dinner in every respect. He also caught some extras which he has dished out to family and friends. You gotta share the love. 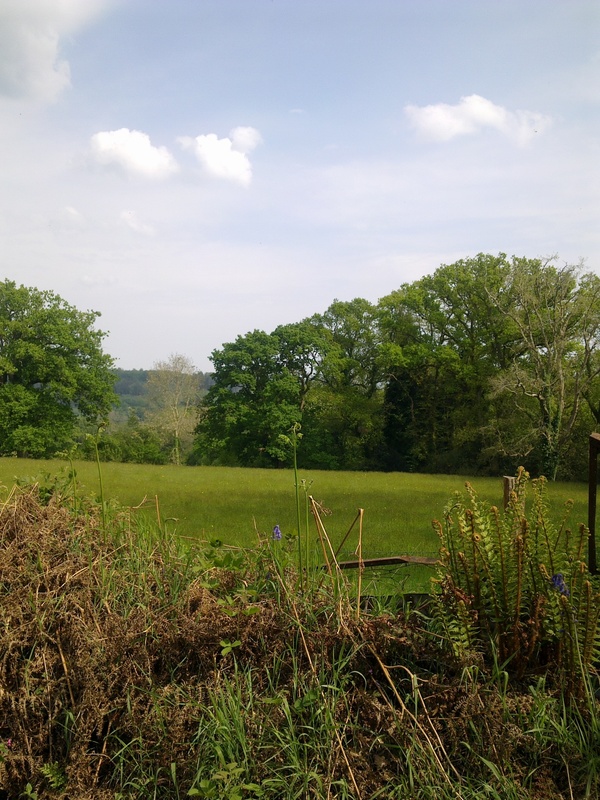 As for the other benefits of living where we do…I’m loving the sunshine right now. There’s a cafe with an amazing location at the far end of the seafront. It’s one of those places that have been going for years and years and have barely been touched in that time. It is boarded up during the winter and the table and chairs are old patio furniture. The most expensive drink on the menu is about £1.90 and the most complicated food you can get your hands on would be a jacket potato. It looks out over nothing but sea, sky and the cliffs. The cafe is beyond unpretentious and I love it. If it ever came up for sale I have no doubt someone would ‘do it up’ and it would become another boring, generic cafe with matching furniture, cream walls, crazy prices and zero atmosphere. When the weather is good we tend to meet our other mum and baby friends down there. And if sitting by the sea with your friends on a sunny afternoon isn’t a good enough reason to take a wage cut and go part time then I don’t know what is! Find out my current interest rate for ISA 1. Ask if it can be improved and by how much. Ditto for ISA 2. Check interest rates with other providers, remembering to look at rates for both new accounts and for transfers (rates for transfers rather than new accounts tend to be less). Consider if it is worth opening a new ISA for any savings in the current financial year. Fisrt up, ISA number 1. I had already popped into my local branch and asked about the interest rate. A staggeringly crap 0.5%. Just by asking, they increased it to over 2.5%. After thinking about this I’ve decided to keep it open. By transfering it I could only get an extra 0.3%. Since this ISA is ‘attached’ to my current account (thus very convenient) I decided to leave it where it was. Second up, ISA number 2. I spent a frustrating few days trying to contact my ISA provider but the line was constantly busy. Having decided the rate was probably as bad as for the first ISA (and their customer services weren’t up to much since I couldn’t actually get hold of anyone) I thought I’d open a new account and transfer it out. By coincidence they sent me their statement for the year 2010/2011 this morning. I was pleased to see that, despite me not contacting them or chasing them up, my interest rate had not dropped and I had earned over £90 in interest – yay! I’m really impressed that they gave me their current ‘best rate’ in spite of me not being a new customer or hounding them about it. Long may it continue. I’m leaving my money where it is. Which left the last point on my ‘action plan’ – deciding whether or not to open a new ISA and where. While I’m happy enough with where my current ISAs are, I decided I’d like to take advantage of some of the offers available for new customers/ISA accounts. I checked Money Saving Expert for the latest deals and chose a provider that is offering 3.3%. If the interest rates go up then so does my interest payment but they won’t go below 3.3% if they drop. Great! The offer is only ‘good’ for the first year though so I’ve made a note in my diary to review it then. I made a call and 17 minutes later (my phone tells you how long each call is – I’m not that much of a freak, honest) my account is all set up. Yay! I really do feel that I’ve done something worthwhile with my time on this and I’m looking forward to getting as much into that new ISA as I can. I’ll be trying to get my ‘business head’ on over some other areas of our finances shortly. Watch this space. 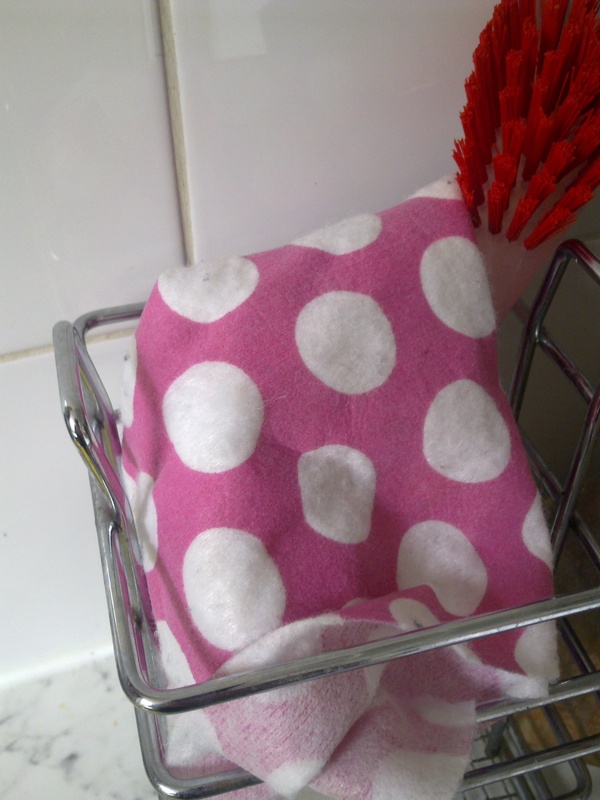 On a final, and rather different, note – do you use washable kitchen cloths? Mum recently introduced me to these pretty cloths that you can buy in Tesco. They have worked out to be about 50p each but, rather than throwing them away when they are ‘dead’/falling to pieces/generally too manky you can pop them in the washing machine and they come out as good as new – ta da! I know plenty of people chop up old T-shirts etc and make cloths which is a great idea. I’ve never done this, mainly because I take clothes to the charity shop when I’m done with them but it would be worth giving it a go if you had something ripped that couldn’t be reused. Plus these are so pretty. I’m convinced they are saving me money already. Particularly with Baby around, I seem to spend a lot of time wiping things up these days and they are so small they can easily be added to a regular wash (so no cost there). Brilliant! Eek – I’m pooped. It’s been a tiring few days what with work, Baby not sleeping too well and having had a bit of a cold. Still. Onward and upward! We’ve been making the most of what good weather we’ve had and going out and about. It’s looking fairly unlikely that we’ll be having a holiday this year so we’re trying to make the most of the fact that we already live in a tourist destination. 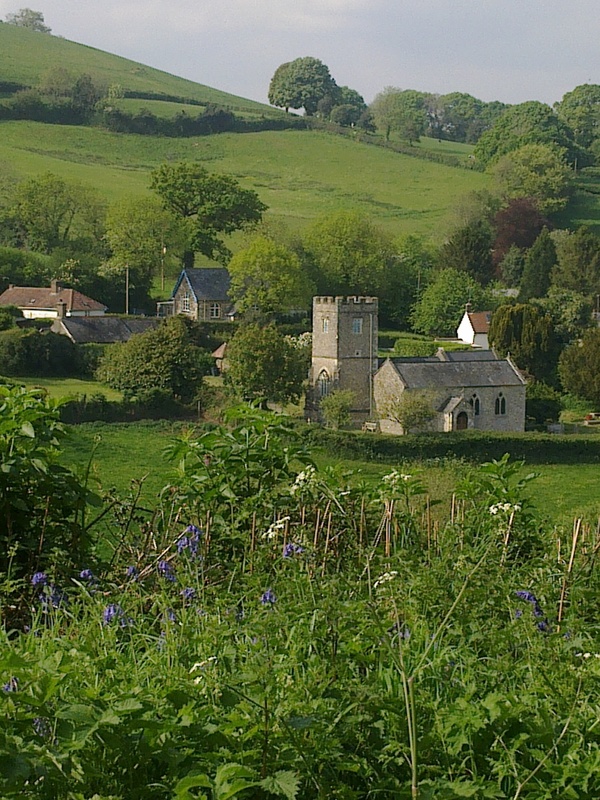 We’ve gone to various child-friendly places and done lots of wombling around the countryside. One thing we decided to spend some money on was year long membership to a local park. 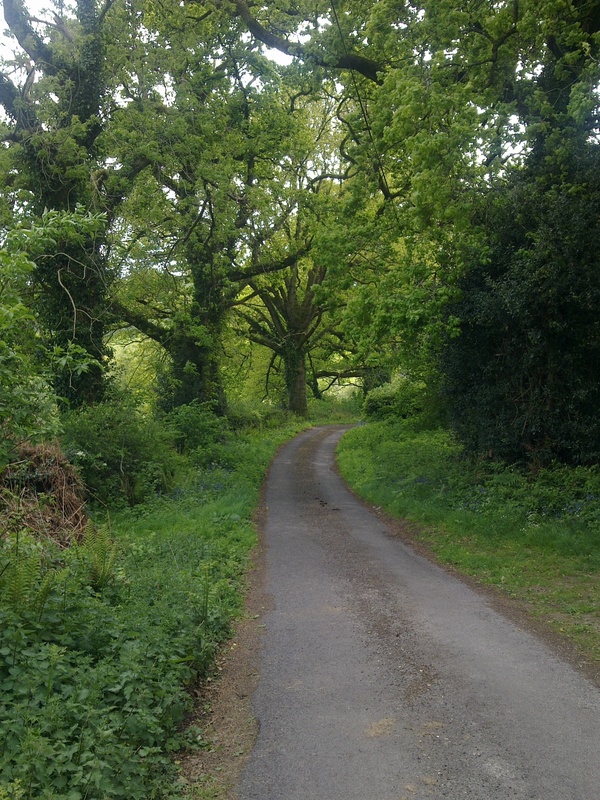 They have huge, huge grounds with lots of gardens, walks and outdoor and indoor play areas. Quite a few of our other friends are members too so it is a great place to meet up. It is a little bit of a drive but other than the petrol we won’t need to spend any more. Baby gets in free and it cost each of us around £15 for the year which I think is well worth it. I should be getting paid in the next few days – yay! What a novelty. It’s been an age. I’m looking forward to being able to put some money back and start saving again. 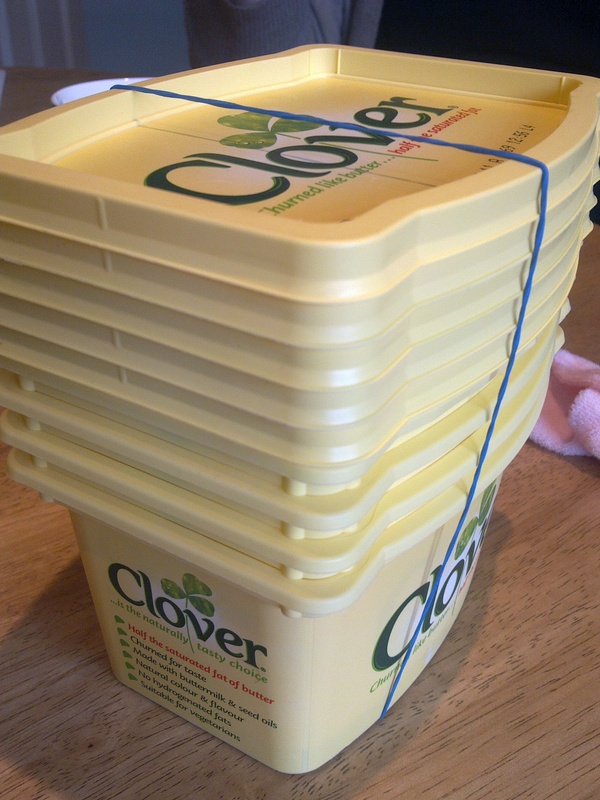 Mum and Dad have been saving their used Clover tubs for me. They’ve been coming in really handy as soup containers. My tupperware supply is a bit of a mish mash. I really want some of those decent ones with the four flaps that click into place and keep liquid ‘in’ properly. But they are really expensive. So I’m making do with whatever I can get my hands on at the moment! Today was food shop day and we went to Co-op instead of Tesco (to save a bit of money on petrol). It came to £40.60 which was great as I bought loads of meat. Co-op are still running their 3 for £10 offer on chicken so I bought 3 whole ones (two of which are now residing in my parents freezer – not enough room in our four drawers!). I’ve pretty much given up buying portions (breasts, thighs etc) because you get so much more for your money when you buy a whole one. For ages I had it in my head that cooking a whole chicken for anything less than a proper roast dinner was a waste somehow. Not anymore. Tomorrow we’re having a roast-chickeny-caesar-salady type affair and I’ll be using the rest of the chicken to make my first ever chicken pie (because I bought some frozen pastry before Christmas and it is still sitting in the freezer, waiting for action). Eek. I’ll let you know how that goes. I also bought 2 packs of lamb mince as my planned ‘batch cook’ for the coming week is shepherd’s pie (those lamb stock cubes bought on offer last week will be coming in handy already) and two packs of beef which have gone straight into the freezer.